Long ago, a young woman known as Mary Bloodsworth lived in a tiny cottage in a forest in Massachusetts. Mary sold healing herbs and other remedies to people who came from far and wide to see her. People say she was beautiful and that she enchanted many men. As time passed, some grew jealous of the attention she received, and villagers began to tease her behind her back, calling her a witch. People whispered that Mary would never marry or bear children. One year, village girls began to disappear. When the first girl vanished, people said she had run away. But as time passed, more and more girls disappeared. Their families were overcome with grief, and all the villagers searched the forest, the streets, the houses, pastures and barns. They found no sign of the missing girls. Some of the villagers went to Mary’s home in the woods to ask if she had taken the girls. Rumors were spreading. Mary told them she knew nothing of these girls and had never seen a single one and, yes, of course they were welcome to search her house. No one knows if they did. Still, more rumors of Mary’s powers spread. Later that autumn, on a cold evening, a strange sound woke the daughter of the village miller. She rose up from her bed in the middle of the night and walked outside, following the sound that no one else heard. But the girl ran so fast, he quickly lost sight of her. The miller’s wife ran outside, too, and they began to chase after their daughter. Their screams woke the other villagers, who ran outside to help them. Suddenly, the villagers saw a strange glow at the edge of the forest, so they followed that light. They came to a tree, where they saw Mary holding a magic wand pointed toward the miller’s house. The miller’s daughter was there too, glowing in an unearthly light. It seemed Mary had cast a spell on the girl. The villagers raised their weapons — shovels, pitchforks and rifles. 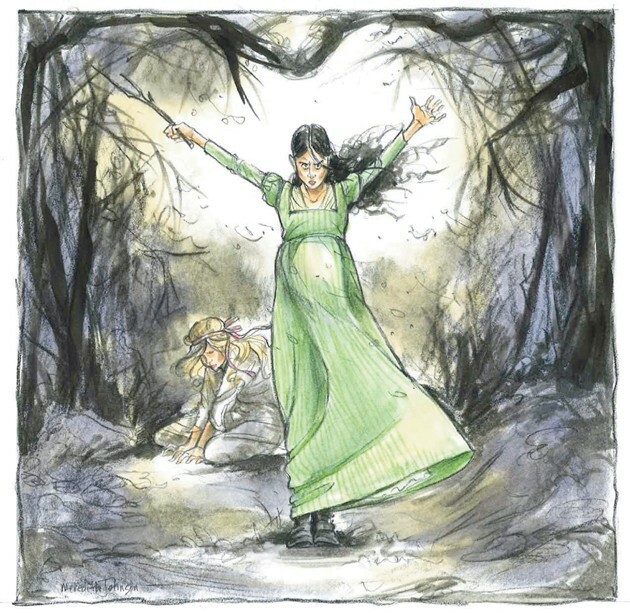 But upon hearing the people coming, Mary broke off her spell and raced into the woods. The villagers chased after her, and when they reached her cottage, they captured her. As she thrashed about, fighting off the villagers, Mary broke a mirror, cutting her hand. Mary was put on trial, and at the trial the miller’s daughter described the sound she had heard as a melodic whistle, like the wind blowing through leaves and carrying a tune. On the stand, the local minister declared that the baby must be the child of Satan. “The baby must die,” the judge declared. As for Mary’s punishment, though the villagers could find no proof of her having stolen the other girls, when she was set free, they slashed her with the glass of her broken mirror, killing her and her baby. Soon after, the father of the child came forward, but it was too late. Mary was gone, and her spirit was trapped inside that broken mirror. The young man buried the pieces of the mirror in Mary’s grave. As time went by, all the pieces disintegrated, leaving behind only the angry spirit of Mary. Some people say that Bloody Mary can be summoned from mirrors, where they sometimes see her looking out. They say she wears a bloody dress with rusty chains draped around her neck and shoulders. In those days, if a witch was buried in chains, people believed her ghost could not return. But some say girls who look in mirrors must be careful not to say Bloody Mary’s name 10 times or she will reappear and capture your soul.